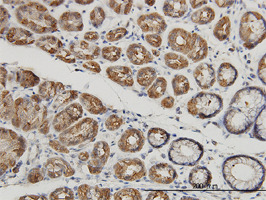 Mouse anti Human Mucin 4 antibody, clone 5B12 recognizes human Mucin-4, also known as Ascites sialoglycoprotein, Pancreatic adenocarcinoma mucin, Testis mucin or Tracheobronchial mucin. Mucin 4 is a 2141 amino acid ~130 kDa single pass, type I transmembrane glycoprotein involved in the repression of apoptosis and in cell proliferation (Carraway et al. 2002).